WILLIAMSBURG — For years, Liz Jose considered creating a cycling group for teenage girls. But when the 28-year-old bike mechanic started seeking women volunteers to help lead the program, the adult riders convinced her otherwise — they wanted a bike group of their own. "All the women I was talking to asked if they could take the program," said Jose, a Williamsburg resident who works at Bike Works on the Lower East Side. "So I sent an email out to 40 women to go on a group ride, and it started getting circulated. Suddenly, I had 100 responses." Since May, when Jose created WE Bike, the citywide female cycling club's email listserv has shot to more than 500 members, which includes transgender women. They participate in social rides, skill workshops and even field trips to spots like the Queens Velodrome track to try out different kinds of two wheelers. 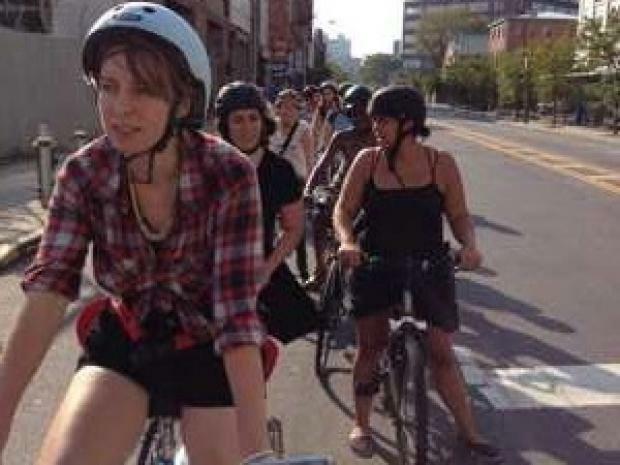 The group mirrors a nationwide movement of gender-focused cyclists, said Caroline Samponaro, an advisory board member of the national group Women Bike and the director of bicycle advocacy with the city organization Transportation Alternatives. "The work WE Bike is doing is locally responding to a demand of women who want a community of bikers," said Samponaro, noting that men outnumber women as bikers nationally by three to one. "And community based programming is one way to get more people biking." Samponaro, who along with Jose attended the first ever National Women's Bicycling Summit last month in California, said that she knew of no other New York City gender-based riding groups like WE Bike. WE Bike is planning a fundraising event that will feature the bicycle dance group Heels on Wheels, DJ's, videos of women cyclists, and the female band Clinical Trials. It is open to anyone — even men — who supports the group, Jose said, noting that she hoped to raise enough money to apply for non-profit status. "The goal is to make riding accessible," she said. Jose said she used to be intimidated to go on group rides, thinking it would be all men on $3,000 bikes. "With WE Bike, it's whatever bike you have and whatever clothes you're wearing," she said. "Let's get on bikes and do something." Past social rides have included an ice cream parlor tour and a visit to different bike frame workshops in Brooklyn. Jose hopes to hold a women's bike polo clinic, too. And for female bikers like Kristin Breivik, who stumbled upon the group this summer through a friend, WE Bike keeps her motivated riding around the city and gives her a chance to learn practical mechanics skills. "I had biked with classmates in grad school, and I wanted to connect with other bikers now that I don't have that community," said Breivik, 27, who recently graduated from the School of Visual Arts,. "I didn't know much about bikes and I figured this would be a good way to learn." WE Bike is holding their fundraising party Oct. 10 at 7 p.m. Entrance is $8.